This one bedroom is about 50 square feet larger than the Cypress plan, if you need a bit more space. 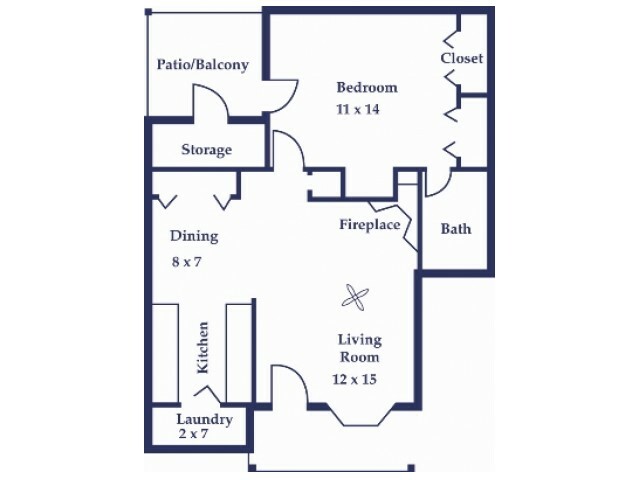 Features a separate living and dining area (with a large closet for storage!) and a galley kitchen just off the dining room. You will have all the appliances you may need in addition to full size washer and dryer connections. Plenty of windows, including a large bay window, will let you have lots of natural light. The bath is located in your bedroom as well as the entry to your private patio. The bedroom features two wall closets and will accommodate larger furniture. Your private patio has a large outside storage room as well. You will have a cozy fireplace, ceiling fans in the living room and bedroom in addition to overhead lighting in all rooms.